Home Books Is “Heaven Is for Real” For Real? Earlier this week, I sat down with my copy of Entertainment Weekly‘s summer movie preview and I flipped through it, taking note of all the movies that I have to go see this summer. And yes, I phrased that correctly. I have to go. It is imperative that I see these movies. The list is fairly long, but there is one noticeable omission from it. 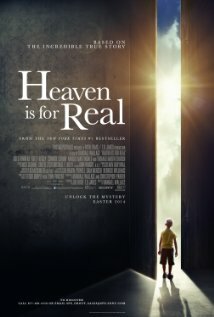 I will not go to see “Heaven Is For Real.” I simply can’t do it. And yes, I phrased that correctly. I can’t go. That may seem a little odd. I mean, I’m a Lutheran pastor. I should be happy that a movie with strong Christian themes is out in theaters now. And really, isn’t this movie, about a young boy who goes to heaven, just the perfect pairing for the Easter season? Now, granted, I haven’t seen the movie and usually, that’s enough to keep me from being critical of something. It’s one of my personal pet peeves when someone judges a book by its cover. In this case, though, I feel that I have to be a little more discerning simply because this movie, while well-intentioned and well meaning, misses the mark. The reason I can say that with confidence is because I’ve seen opinions from people that I trust regarding the whole “Heaven Is For Real” phenomenon. For example, earlier this morning, I read this blog post by Randy Alcorn concerning the movie. Mr. Alcorn has seen the movie and, while he’s perhaps a bit more forgiving than I am, he raises a number of red flags about its content or, more specifically, its lack thereof. And that right there is the primary reason why I won’t go see this movie. It is well-meaning and I’m sure the Burpos, in telling Colton’s story, were well-intentioned, but as Dr. Gibbs rightly points out, the hope that Christians have for eternal life is not going to heaven. That’s only half of the story. The true hope we have is that we will one day rise! Notice how Paul’s last words: “Therefore encourage one another with these words.” When people are faced with death, Paul says, encourage them with the promise of the resurrection. Remind them that their loved one will rise at the Last Day. Or look at what happens when Jesus encounters death. There’s only one time that He speaks of heaven, and that’s to the thief on the cross. In every other instance, though, whenever Jesus went to a funeral, He didn’t speak some pithy platitudes about going to heaven. No, He rolled back the powers of death. In the New Testament, every time Jesus went to a funeral, the dead were raised back to life. That is the hope we have, the promise of resurrection through Christ, not some nebulous vision of some otherworldly place. Instead, it’s the hope that this body, the body you have right now, will be brought back to life, imperishable and immortal.